Dogs tend to wear paths, especially along fence lines because they are territorial and through your lawn because they are creatures of habit. What dog has not laid down in a Flower bed and smashed all the flowers? Some dogs like to dig. Not to mention that the urine creates burn spots in grass. 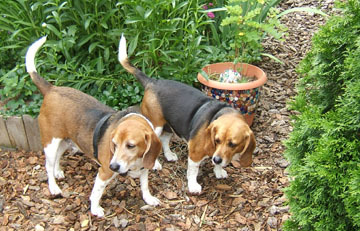 When beagles joined our family a new realm of gardening started. 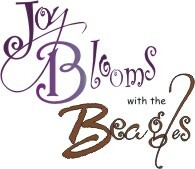 How do you make the garden safe of the beagles without eliminate the aspects that I enjoy? I found that it wasn't all that difficult. Planning a dog-friendly garden begins with the dog. Watch your dog. How does he/she use your garden? What are his/her habits in the garden? Where does he/she like to nap? Where does he/she like to play? Does your fir-kid tend to potty in the same area? Where does he/she watch over his/her domain? In Colorado, Billy and Betty were fond of sitting on the deck and from that elevation they would see the cars go by and people walking their dogs. We won't have this kind of deck in Lubbock so we will have to build them a perch so they can be "up." Elimination Spots: This didn't work for me, but some gardeners claim they were able to train their fur-kids "to go" in a specific area - some where in the back of the property. Dilute urine spots: Where your female dog pees, saturate the area with water. I keep a water can filled with water at the ready. When Betty goes on the lawn, I follow her with the can of water and saturate the spot. Diluting the urine right way seems to help in avoiding those yellow spots. Billy's urine doesn't seem to cause any damage. Pick up Poop - It is Important So be a good neighborhood, keep your fur-baby on a leash when in public and pick up the poop. How to Compost Dog Waste An easy and safe backyard solution. Start with a garbage can. No dog poop in the compost bin. Compost is a good choice as a soil amendment. If you make your own compost, don't add cat or dog or ferret poop! Pee "Marking" Posts. Set up pee posts around the yard to encourage male dogs to leave their mark there instead of on your favorite plant. An old tree stump, fence post, drift wood - anything vertical works well. This didn't work for Billy. Select plants carefully. You would be surprised to know how many favorite garden plants can make your dog sick or kill them (if they chow down on the plants). Did you know a list of toxic/poisonous plants would include asparagus fern, gladiolas, rhododendron? Check with your local county extension service agent. The ASPCA has a list of plants toxic to dogs. The ASPCA site includes this disclaimer: This list contains plants that have been reported as having systemic effects on animals and/or intense effects on the gastrointestinal tract. Please note that the information contained in our plant lists is not meant to be all-inclusive, but rather a compilation of the most frequently encountered plants. This site list the side effects & what to do is fur-babies eat toxic plants: Toxic Garden Plants If you think that your animal is ill or may have ingested a poisonous substance, contact your local veterinarian or our 24-hour emergency poison hotline directly at 1-888-426-4435. Be especially careful at Halloween & Christmas. While you get all wrapped up in the holiday spirit, don't forget about your fur-babies. Many holiday plants, decorations, and candy can be deadly to household pets. Protect your pets. Don't use any metal lawn edging anywhere in your yard. The protective plastic covering will come off, and your pet will run across the exposed edging and cut their paws. I learned this the hard way. Betty torn a toenail on the metal edging. She spent the night in the pet emergency hospital and we spent, well big bucks. Mosquito free zone. If you have a rain barrel - and doesn't everybody - fit it with a secure lid. Two reason for this. One is for the safety of your dog and two to prevent mosquitoes from laying eggs in the still water. As a word of warning, mosquitoes will lay eggs in standing water, so survey your yard to eliminate places where water can accumulate -- for example, that half-full watering cans. If you have a pond or a birdbath, add a agitator or a pump to keep the water moving. Billy and Betty faithful eat their heartworm pill every month. Heartworms are blood borne parasites transmitted by mosquitoes. So make your yard a mosquito-free zone so neither you or you fur-kid have to suffer with bites. Fences good neighbors make. If there is an area, like a veggie garden or a bed with delicate plants, put up a decorative fence to keep your dog out. Keep it interesting � A bored dogs is a destructive dog. So to keep them engaged. Leave chew toys out; give them a open space to run; and create lots interesting paths and areas for them to explore. Think carefully about the basic layout of your garden. Take your dogs established behavior into account. Consider the routes around the garden that your dog uses the most, and plan pathways accordingly. -- Guess I'll have to wait and see how the beagles respond to a yard of dirt. Follow the leader. You dog has a favorite pathway or will establish one in the yard. Follow their lead and create a permanent pathway for your dog and yourself. Make the path at least 3' wide. You can add stepping stones or decomposed granite or pea gravel. Observe and respect their path. Don't put a flowerbed in the middle of it. You can incorporate a landscape path there. The dog's won't mind if their path gets paved, so to speak. Consider create a dry creek bed . Pathways are best if at least 3' wide. Plants by the paths should have soft foliage, like petit ornamental grasses. Flowerbed should not be an obstacle. Dogs will head directly through your flowerbed if it is in their way. Placing flowerbed around a central lawn area will minimize the damage of dogs trampling flowers. If you can't rearrange your yard, plant more robust plants that won't be hurt by dog traffic. Watch out for slippery surfaces. For your safety and that of your fur-kid, avoid using stones that become slippery when wet. Don't use Cocoa Bean mulch. Although it is attractive and smells like chocolate - don't use it. The chocolate smell will tempt your dog to munch on the mulch. It can make him sick. Secure the fence. Some dogs may dig their way out of the garden. I have read that placing landscape material around the circumference of your fence will prevent dogs from digging. Betty and Billy are not diggers so I can't personally attest to this suggestion. There are many gaps under the fence at our new house. We will have to add soil and eliminate gaps like these. Don't want to tempt the dogs and certainly don't want to invite other creatures in. Let them patrol the borders. If a fence surrounds your property, I bet you have a path way there. Almost all dogs will chose to walk next to the fence - creating a "dog path." Dogs have a tendency to "patrol" the perimeter of their outdoor space. This being the case, leave some space for your dog to roam. Don't plant directly in front of the fence. The dogs won't mind if you lay flagstone or other landscape material over their path. They will still use it and you will gain a pretty pathway and it will keep digger from digging an escape way. Raised beds are the solution. Dogs usually will not explore a raised bed unless you give them an easy way to climb up. Accommodate their habits. Billy & Betty aren't diggers, but a lot of dogs are. If you dog like to dig, give them a place to dig. Bury a treat or toy to encourage them to dig where you want them to dig. Don't poke 'em in the eye. Be careful about plants with thorns that are at "eye-level" of your fur-kid. Become an organic gardener. Eliminate or minimize the use of chemical fertilizers & pesticides. You will have a safer environment for both you and your dog. Even fish, bone or blood meal can be attractive to dogs. If you use these products be sure to dig them deeply into the soil and don't leave residue on plants. You won't kill of butterflies and other beneficial insects either. Wipe your paws. A "buffer zone" leading to the doggie dog will minimize the amount of dirt tracked into your house. This buffer zone is a place where your dog can wipe his paws. Consider an area of small gravel or a long walkway to the entrance. Give 'em a shady place to rest. Dogs, like people, love shade. Unlike humans, dogs don't sweat. They'll seek out shade where ever they can. Be sure to have ample water for them. So how about building an arbor or gazebo? Then you both have a place to relax in the shade. These are some of the guidelines that worked with Betty & Billy. eMail me if you have other ideas.